For resource-constrained police departments, time is money. The faster they can issue citations, the more revenue they bring in to fund the department. Moreover, completing each citation more quickly minimizes safety risks for officers. With a traditional approach to citations, MSP airport officers spent five to seven minutes handwriting each one and then had to re-enter that data into an office system when their shifts were over. In addition to the redundant data entry, as many as 30 percent of the handwritten paper tickets were subject to typos, illegibility or the elements of Minnesota weather—reducing the department’s ability to collect on citations. After years of looking for a better approach, the MSP airport police department found a solution. The department implemented an e-citation system to automate traffic and parking enforcement, tow slips and driver’s exchange forms. 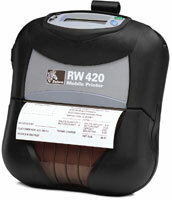 The solution enables mobile electronic ticketing on handheld computers and printing with Zebra RW 420 mobile printers. Officers now issue and print citations electronically for each offender, in less than 10 clicks. At the same time, citations automatically upload via file transfer protocol into the records system, eliminating manual entry. The Zebra RW 420 printers were chosen specifically for their size and durability. At a little over 6 inches wide, they are compact, easily fitting in existing squad cars with laptops or handheld computers, or on belts. They also prove hardy in tough Minnesota winters. “We needed hardware that can withstand the climate here, and the Zebra printers work in excess of about 20 below,” Mademann said. The department formatted the tickets to include the key information that officers and offenders need to enter and print on citations. Laser-quality printing on thermal paper means no more frozen ink pens, ink washing or rubbing away, or illegible handwriting. All names, addresses, numbers and citation types clearly appear on tickets, reducing confusion for office staff, courts and offenders. As each roll of paper lasts an entire shift, officers don’t need to worry about maintenance or changing rolls during a citation. Plus, printing speed—about 10 seconds per citation—also contributes to faster stops. With the e-citation system, the police department reduced average citation time from five to seven minutes down to one to two minutes—cutting total traffic stop time by more than 30 percent. As a result, officers now issue 15-20 citations in a nine-hour shift, instead of 10-15 previously. The printed tickets also hold up in court at a much higher rate. And because they immediately go into the database, they cannot be misplaced. Overall, officers are able to stay focused on law enforcement rather than writing citations. “Officers keep their heads up and their eye contact remains on the suspect versus the notepad,” Mademann said. In turn, the department reduces its costs and generates more revenue. Printed tickets cost less than 10 times the amount of those in pre-printed booklets. More significantly, without data entry, the department no longer needs two full-time temps to input ticket data and has eliminated the previous seven- month backlog of data entry. At the same time, more citations translate to higher revenue for the department. “In 2007 and 2008, our citations and revenue jumped 30-40 percent with the implementation of e-citations. We’re bringing in a significant amount of new revenue and increasing officer safety. We’ve been very happy with it,” Mademann added.